Belyashi is the national dish of the Tatars, common in Slavic countries. Its also one of my favorite dishes from childhood. I remember in Ukraine when I was little and they sold belyashi on the streets or at the market, it was a very popular street food, even now one of the most common fast food meals. 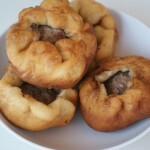 Belyashi are round shaped, fried pirozhki with finely chopped meat, usually with a small hole on the top. Traditionally belyashi are made with lamb, but I use beef, its more practical and the flavor is still great! You can add a little pork fat for more flavor, or add more herbs like dill, parsley, or cilantro. Instead of making the dough yourself you can buy a package of Pillsbury buttermilk biscuits or dinner roll dough. Serve belyashi by themselves or with any broth based soup. In a deep bowl mix the warm milk with water, add the yeast, sugar, salt and 2 tbsp of flour. Stir and set aside for 30 minutes. Then gradually add the rest of the sifted flour. The dough should be slightly sticky, but workable. I use a stand mixer with a dough hook. Cover the bowl with a towel and put in a warm place for 2 hours. You can even put the dough in a lightly heated oven. Mince the meat with the chopped onion and garlic, add milk or water in the bowl, then salt and pepper and stir. Divide the dough into pieces (about 60 grams each) and roll out with a rolling pin on floured board into round circles. Place about 1tbsp of the meat filling in the center, gather the dough around the filling, folding and forming little pleats as necessary, leaving the middle open. Lightly tap with the palm of your hand to flatten the pastry slightly. This will eliminate excess air and spread the meat more evenly inside the pastry. 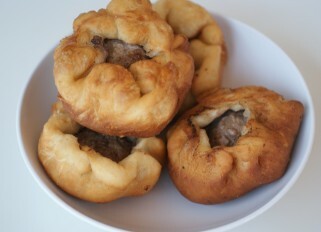 You should have a round, open pastry with the meat filling exposed in the center. You can oil the cutting board or sprinkle with flour and fold belyashi there. Heat the oil in a large, deep, heavy-bottomed pan and deep fry belyashi until golden brown. First put the open side down to the oil, then turn, reduce the heat slightly, and cook until the other side is golden-brown. There should be enough oil to cover belyashi half-way up the side. Place on paper towels. Keep them warm in a low oven until all belyashi are ready. Best to serve hot.